Joyce Glazer has a strong belief that people have a responsibility and obligation to support their communities. She feels that life has been good to her and that she is in a position to use her talents and skills to contribute to the less fortunate. She chooses projects where she can make a difference, and words on each of them passionately. Her time is split between Arts & Culture and Human Care Services. Joyce serves as Chairman of The Salvation Army's Metropolitan Advisory Board, and has brought the board into a new era. She organized the first board solicitation and community campaign, involving more business leaders on the board and in underwriting major events. As President of country Friends, she was responsible for a reorganization, which included mew membership programs, doubling revenues, and tripling the sales of the consignment shop. Joyce was also president of The Salvation Army women's Auxiliary and the Equal Partners Investment Club. 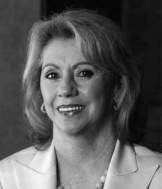 She served as a board member for Mingei International Museum, Patrons of the Prado (founding member), San Diego Opera, and the USCD University art Gallery. She has served as chair or Co-chair of many major fund-raising events in san Diego, and recalls the Super Ball to benefit Children's Hospital as one of the most memorable since it was a one time event attracting over 2,000 people. Other events include: ECS Angels In The Park to be held this summer; Country Friends Race Day and the 40th Annual Fashion Show; Monte Carlo Ball, Museum of contemporary Art; Opening Night Gala, San Diego Opera; Mingei International Museum Anniversary Dinner; Bowtie Ball New Year's Eve Gala; Hebrew Home Auxiliary Fashion show; and Celebrate Our Cultures, Children's Hospital and Health Center. Joyce has received many awards and honors for her work, which includes selection as one of San Diego Magazine's "50 People To Watch" twice in five years. Joyce Glazer is a native lowan, and moved to San Diego in 1989 from Des Moines, Iowa. She lives in San Diego with her husband Edward Glazer. In spite of her very busy schedule, she always makes time for her five grandchildren who are the light of her life. Women's International Center is delighted to have the opportunity to acknowledge and celebrate the life and contributions of Joyce Glazer with the 2001 San Diego Living Legacy Award.